It’s almost like we say this every year, but Computex hasn’t even officially started yet and we already have a lot to talk about. Everything from the power requirements of next year’s GPUs from ATI and NVIDIA to the excitement surrounding Intel’s Conroe launch is going to be covered in today’s pre-show coverage so we’ll save the long winded introduction and get right to business. We will first address some of the overall trends we’ve seen while speaking to many of the Taiwanese manufacturers and then dive into product specific items. We’ll start with the most shocking news we’ve run into thus far - the power consumption of the next-generation GPUs due out early next year. ATI and NVIDIA have been briefing power supply manufacturers in Taiwan recently about what to expect for next year’s R600 and G80 GPUs. Both GPUs will be introduced in late 2006 or early 2007, and while we don’t know the specifications of the new cores we do know that they will be extremely power hungry. The new GPUs will range in power consumption from 130W up to 300W per card. ATI and NVIDIA won't confirm or deny our findings and we are receiving conflicting information as to the exact specifications of these new GPUs, but the one thing is for sure is that the power requirements are steep. Power supply makers are being briefed now in order to make sure that the power supplies they are shipping by the end of this year are up to par with the high end GPU requirements for late 2006/early 2007. You will see both higher wattage PSUs (1000 - 1200W) as well as secondary units specifically for graphics cards. One configuration we’ve seen is a standard PSU mounted in your case for your motherboard, CPU and drives, running alongside a secondary PSU installed in a 5.25” drive bay. 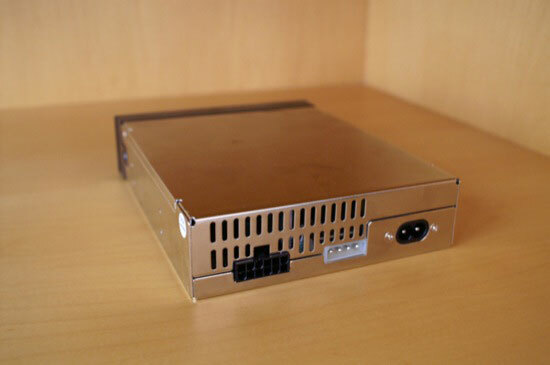 The secondary PSU would then be used to power your graphics cards. 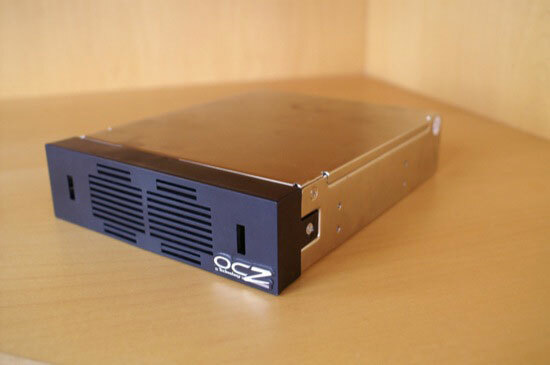 OCZ had one such GPU power supply at the show for us to look at. As you can see above, the 300W power supply can fit into a 5.25" drive bay and receives power from a cable passed through to it on the inside of your PC's case. 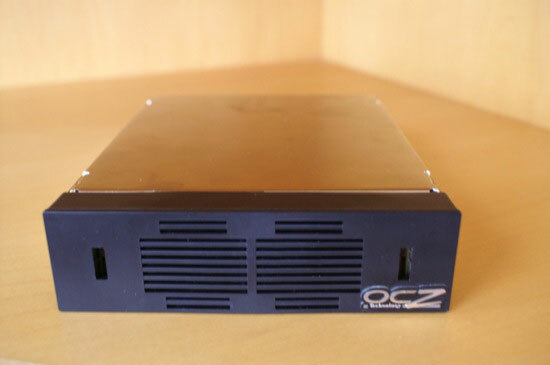 OCZ is even working on a model that could interface with its Powerstream power supplies, so you would simply plug this PSU into your OCZ PSU without having to run any extra cables through your case. In order to deal with the increased power consumption of this next-generation of DirectX 10 GPUs apparently manufacturers are considering the possibility of using water cooling to keep noise and heat to a minimum. As depressing as this news is, there is a small light at the end of the tunnel. Our sources tell us that after this next generation of GPUs we won’t see an increase in power consumption, rather a decrease for the following generation. It seems as if in their intense competition with one another, ATI and NVIDIA have let power consumption get out of hand and will begin reeling it back in starting in the second half of next year. In the more immediate future, there are some GPUs from ATI that will be making their debut, including the R580+, RV570 and RV560. The R580+ is a faster version of the current R580, designed to outperform NVIDIA’s GeForce 7900 GTX. The RV570 is designed to be an upper mid-range competitor to the 7900GT, possibly carrying the X1700 moniker. The only information we’ve received about RV570 is that it may be an 80nm GPU with 12-pipes. The RV560 may end up being the new successor to the X1600 series, but we haven’t received any indication of specifications. After the HDMI/HDCP fiasco that both ATI and NVIDIA faced earlier this year, we’re finally seeing video cards equipped with HDMI outputs and full HDCP support. 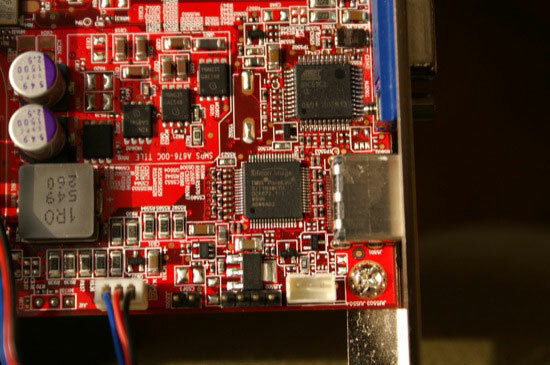 The HDCP solution of choice appears to be a TMDS transmitter by Silicon Image that has found its way onto almost all of the HDMI equipped video cards we’ve seen. 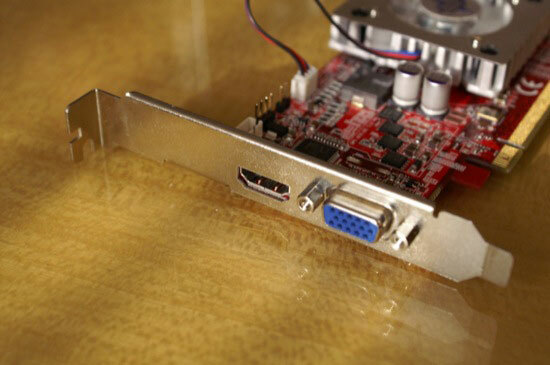 While some of the HDMI equipped graphics cards simply use the HDMI output as a glorified DVI connector, other companies have outfitted their designs with a SPDIF header to allow for digital audio passthrough over HDMI as well. Remember that the HDMI connector can carry both audio and video data, and by outfitting cards with a header for internal audio passthrough (from your soundcard/motherboard to the graphics card) you take advantage of that feature of the HDMI specification. Alongside HDMI support, passively cooled GPUs are “in” these days as we’ve seen a number of fanless graphics cards since we’ve been here. The combination of HDMI output and a passive design is a definite winner for the HTPC community, who are most likely to be after a video card equipped with a HDMI output at this point. When I read that line about 1000-1200 watt PSU's, all I could think of was Doc Brown in Back to the Future yelling "1.21 Gigawatts!?!"... (yeah I know - kilowatt != gigawatt... but still). Exactly my first thought. The concept of a seperate external supply for a graphics card is already ludicrous to me, if this becomes standard then I would hate to see future progression from there. Does anyone remember the Taco Town SNL skit? I desire better video as much as anyone else, but I draw the line when I need a nuclear power station to run it. ATI/nVidia must have forgotten that electricity DOES cost money. Actually, Pluto is the Roman name for the Greek God Hades. Charon was indeed the ferryman of the Underworld, but the river wasn't Styx, but Acheron. I believe that there were four famous rivers in the Underworld, Lethe was another, but I can't remember the fourth. Actually, Pluto is the Roman name for the Greek God Hades. It is another Greek name for Hades (from Greek ????t? ?, Plouton), but it was adopted by and hence much more commonly associated with Roman mythology. Didn't really see anything new here. Audio on a riser card - DFI has been doing it for awhile now. Lighting around the I/O shield - Been done before. No, I wasn't saying that anything was new in the industry, but new at least to Asus. IMHO the concept motherboard was an interesting exhibit, even if it isn't the only one of its kind. More to the point, what's noteworthy is that Asus - along with other manufacturers as well, hopefully - is considering following DFI's Karajan module concept. That can only be a good thing, as long as the manufacturers sincerely mean to improve noise immunity and not just throw it in as a gimmick to charge a premium for.